We moved again, baby, from the Russell Islands back to Stirling Island of the Treasury group. My life seems to be one mad rush of moving and all that entails, namely, packing and unpacking. We had 20 minutes notice this Thursday so were really stepping fast. Took off from Sunshine1 strip and headed north. Arrived at Stirling two hours later, after bucking a belt of storm clouds. Map courtesy of Peter Dunn of “Australia @ War” at http://www.ozatwar.com. Nine of us were on the trip including a medical sergeant, and a Marine radio operator who had been discharged from the hospital, after shock received in a crash dip in the drink. They were lucky enough to be picked up by one of our destroyers who discharged him at the Russell Islands’ hospital. He was being returned here for duty. No squadron here needed men so we remain unassigned. Are temporarily quartered and fed by the 75th Squadron which is at present occupying the area we were in before while assigned to the 69th. The good food still prevails here, which is jake2 with me. The rumors are that we’ll be returned to Guadalcanal, a fact which I hope is definitely untrue. To backtrack now would take the heart out of me. I still want to fight the Japs, you see, and get this thing over with so all the boys can return home again! Would you like that? Don’t believe we wouldn’t but we want this war continued just so long as it’s necessary to prevent any future war. We don’t want our children to have to finish what we began, only after we were stabbed in the back! That’s definite! We’re awfully happy to get away from that last rat trap. Lord, Honey, you ought to see those big gray beasts and wake up in the middle of the night to hear them patter over a ledge above your head, expecting any moment to feel one drop on you and then run away when you stir in your sleep. The Russells are much more beautiful and serene than Guadalcanal but Stirling is a gem. It has and gives out a feeling of cleanliness that is absent in the other places I’ve seen. Am still mad about the run around we’re getting. The boys who came over with us already have 12 missions in, and we haven’t even gotten a good start as yet. God guides us, though, and we shall trust in Him with all our hearts. Have seen two shows here, Hello, Frisco, Hello3 and Melody Parade4. Watching all those beautiful American girls made me want to go home to you, darling. They were a symbol, but you are the sweetest of all realities. Had quite a laugh at myself today. Was sitting on the cot, writing letters when the canvas bottom split and my abused bottom hit the floor! It’s funny to be sitting pretty and almost comfortably and then to have the bottom fall out of the world. Received 24 letters yesterday and the day before and have really worn out my arm writing them. Usually get letters from folks I’ve written to the day before and then have to begin all over again. I’ve been thinking of you every hour of these days and have dreamed the nights away. How nice it’s going to be to go home again. We’ll baby doll, I’m going to close for these three days. Goodnight, sweet dreams, love is such sweet sorrow, when lovers are far apart. 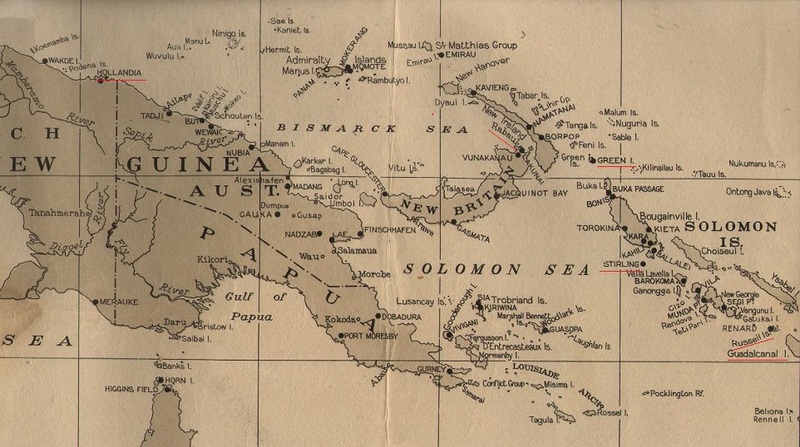 1 During World War II, Banika Island, one of the Russell Island was developed with two air fields: Renard Field, which was also known as South Field and Yandina, and North Field, which was also known as Banika and Sunlight. In his journal, Wayne makes reference to a “Sunshine Field”. I believe that he is referring to Sunlight Field, i.e., North Field. See “Russell Island Group.” PacificWrecks.com (http://www.pacificwrecks.com/provinces/solomons_russell.html : accessed 16 April 2014). 2 “Jake”, meaning excellent, fine, O.K., was recognized as criminal slang in 1914. By the 1920s, it was in common use. Jackson, Louis E. and C. R. Hellyer. A vocabulary of criminal slang, with some examples of common usages. Portland, Oregon: Modern Printing Co., c1915. 3 Hello, Frisco, Hello, a musical comedy, was released in 1943 by Twentieth Century Fox Film Corporation. It starred Alice Fay, John Payne, Jack Oakie, June Havoc and others. See http://www.imdb.com/title/tt0035982/?ref_=fn_al_tt_1. 4 The musical, Melody Parade, was released in August 1943 by Monogram Pictures. It starred Mary Beth Hughes, Eddie Quillan and Tim Ryan. See http://www.imdb.com/title/tt0036151/?ref_=ttfc_fc_tt. This entry was posted in Uncategorized and tagged 69th Bombardment Squadron, 75th Bombardment Squadron, Guadalcanal, rats, Stirling Island. Bookmark the permalink.